Import Using: Set this pop-up menu to choose the import format. This choice is perhaps the most important. Setting: This offers different settings depending on your choice of format. For example, in the illustration, you are about to change the format from the AAC Encoder to the MP3 Encoder in the Import Using menu. After changing the format, you can choose the quality setting for the encoder in the Settings menu. Set this pop-up menu to the iTunes Plus or High Quality setting for most music, or choose Custom to choose a custom setting. The Spoken Podcast setting is for lower-quality voice recordings. See the following bulleted list for more information about encoders and settings, including how they affect quality and file size. AAC Encoder: You should encode music into the AAC format for almost all uses except for burning another audio CD. (AIFF, Apple Lossless, or WAV is better if you plan to burn another audio CD at the highest quality, and MP3 is the only format to use for MP3 CDs.) For music, choose the High Quality or iTunes Plus settings from the Setting pop-up menu. 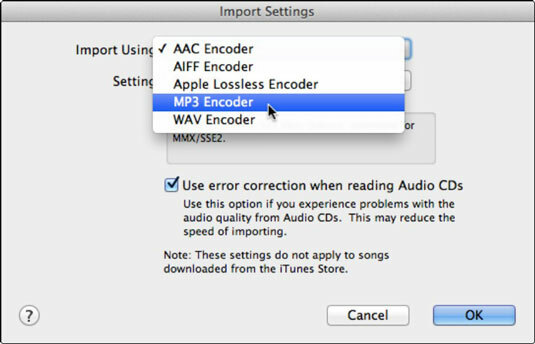 AIFF Encoder: Use AIFF if you plan to burn the song to an audio CD using a Mac (use WAV for Windows) or use it with a GarageBand project. AIFF offers the highest possible quality, but it takes up a lot of space (about 10MB per minute). Choose the Automatic option from the Setting pop-up menu for best results. Don’t use AIFF for songs that you intend to transfer to your iPod or to an MP3 CD. You can rip a CD as many times as you want, and use a different format for each version, as long as you modify the album name or song title to identify each version. For example, you might rip Sgt. Pepper’s Lonely Hearts Club Band with the AAC Encoder for use in your iPod. You might then rip it again after changing the encoder to the higher-quality Apple Lossless or AIFF Encoder, using a different album name (such as Sgt. Pepper-2), for burning onto an audio CD. After burning the CD, you can delete Sgt. Pepper-2 to reclaim the hard drive space. Apple Lossless Encoder: Use the Apple Lossless format for songs that you intend to burn onto audio CDs as well as for playing on an iPod. The music is imported at the highest quality, with compression that doesn’t lose any information (which is why it is called lossless). The files are just small enough (about 45–70 percent of the size of the AIFF versions) that they don’t hiccup on playback on the iPod. MP3 Encoder: Use the MP3 format for songs that you intend to burn on MP3 CDs, or that you intend to use with MP3 players or your iPod — it’s universally supported. If you use MP3, you should choose the Higher Quality option from the Setting pop-up menu. WAV Encoder: WAV is the high-quality sound format that’s used on PCs (like AIFF on Macs), but it also takes up a lot of space (about 10MB per minute). Use WAV if you plan on burning the song to an audio CD or using WAV with PCs. Choose the Automatic option from the Setting pop-up menu for best results. Don’t use WAV for songs that you intend to transfer to an MP3 player or to an MP3 CD; use MP3 instead. To find out more about audio encoding formats, how to adjust custom settings to reduce space and increase audio quality, and how to convert songs from one format to another (and what problems to look out for when doing so). Choose iTunes→Preferences→General on a Mac or Edit→Preferences→General in Windows. The iTunes Preferences dialog opens, showing the General preferences, including the When You Insert a CD pop-up menu and the Import Settings button. Choose what action iTunes should take for the When You Insert a CD option in the General preferences. Show CD: iTunes does nothing else. This preference is ideal if you’re not sure whether you want to play the CD first or edit the song information before importing. Begin Playing: A good choice if you often play CD tracks. 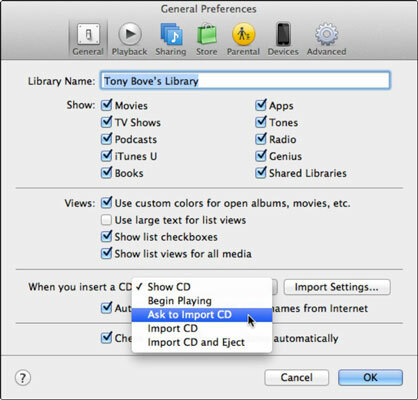 Ask to Import CD: iTunes displays the dialog that asks whether you want to import the CD. This preference is ideal if you are not sure if you want to import the CD every time you insert one. Import CD: iTunes uses the current import format and settings and automatically imports the CD. This preference is useful if you want to use the same import format and settings every time you insert a CD. Import CD and Eject: iTunes automatically imports and then ejects the CD, making way for the next one. This preference is useful for importing a batch of CDs (such as a box set), when you want to use the same import format and settings for the entire batch. Make sure that the Automatically Retrieve CD Track Names from Internet check box is selected (if not, click to check it). This check box is selected by default. iTunes automatically grabs the song titles, artist names, album titles, and so on directly from the Internet. (Optional) Click the Import Settings button in the General preferences to change your import settings, and then click OK.